“As a full-body workout is optimal for all over muscle-growth, puzzle building can be considered a full-brain workout. The brain is comprised of two sides, the left and right. The right side is responsible for emotions, creativity and intuitive thought, while the left side is the logical, orderly and systematic component. Puzzle building also increases visual perception and coordination of muscles. Children start early with large-piece puzzles to help with motor skills and problem solving. 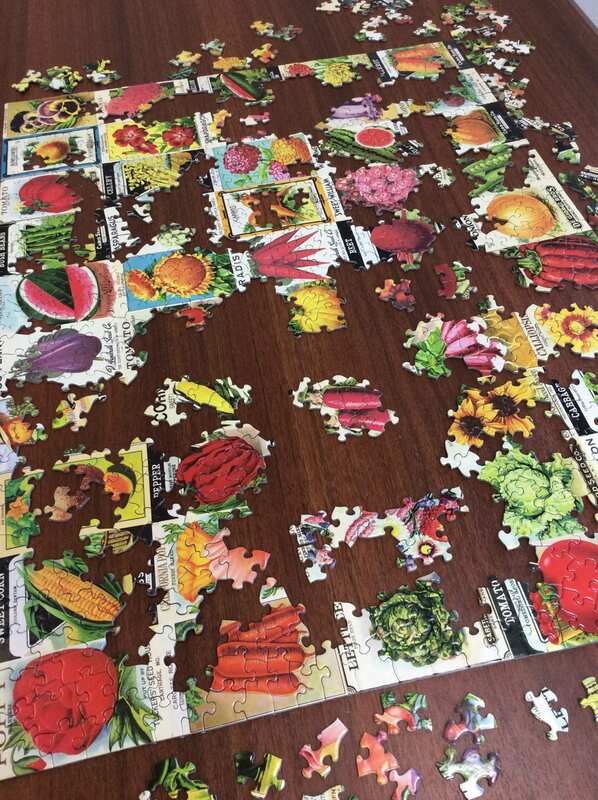 As we get older, puzzles become more difficult with smaller pieces and more detailed photographs. Jigsaw puzzles are a great workout for our short-term memories. 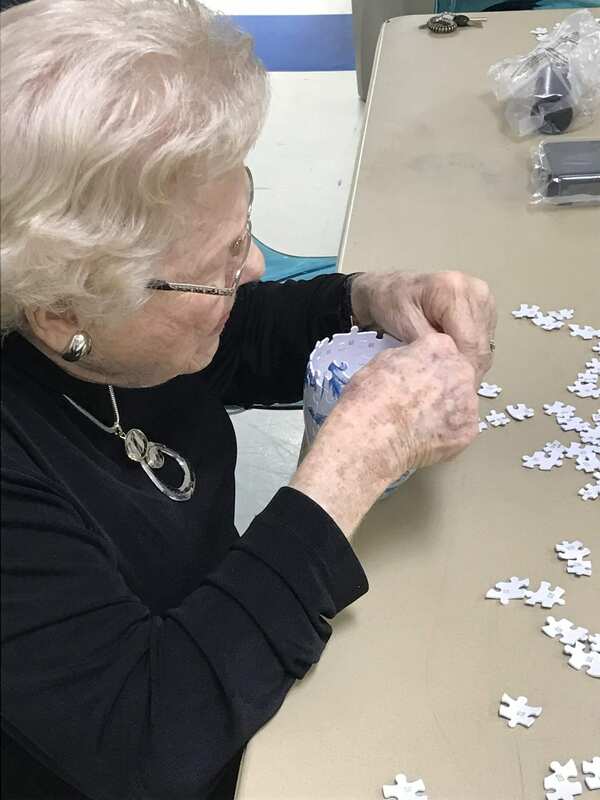 Recalling the shapes and pieces as you scan through your puzzle and then to the pile of pieces, deciding which piece to try next, helps build muscle memory. Residents of Springmoor will also tell you the puzzle table is great way to meet new friends and catch up on today’s news. On almost every floor of the campus you will find at least one, if not two, puzzles in the works. There are groups that meet in the morning after exercise class and groups that gather around the tables after dinner. There are some groups that have trays and separate pieces by color or shape and some that spread everything out on an additional table. You will often find someone’s pet nestled under the table too. 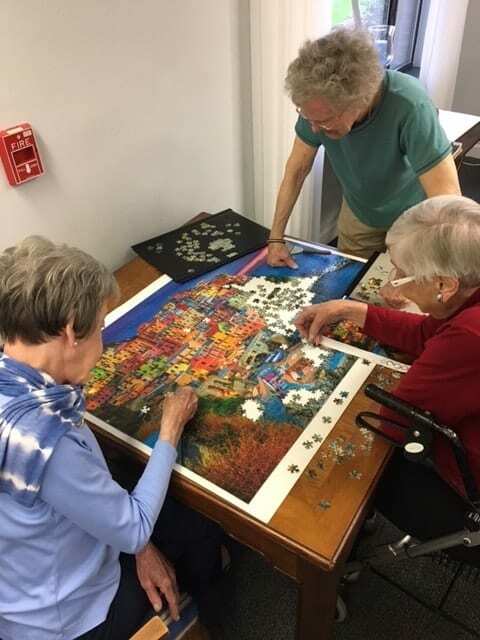 As residents gather for “just a few minutes,” they find they can’t leave the table until they find “just one more piece.” Time together is the best part about puzzle making. Everyone feels a sense of accomplishment as the last piece is put in place. And afterwards, no one wants to take it apart! Several puzzles have been glued together, framed and are hanging above the tables. Peggy Blackburn, Eunice Bland and Pat Gessner are often found at their corner table on the first floor. 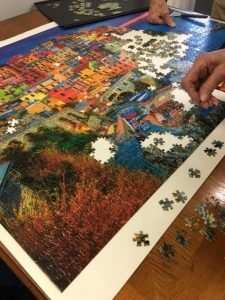 The 2000 piece puzzle they recently completed of Cinque Terre, Italy was even more fun when they discovered that Eunice’s daughter and her husband had visited one of the restaurants on the mountainside. The colors were vivid and the pieces were small making the completion even more exciting when it all came together. 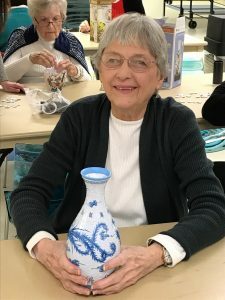 Ann Curren not only works flat puzzles but 3-D puzzles as well. When Leah Willis, our Residents Life Director, spotted her new style, she quickly ordered some for an afternoon activities class. They were a huge hit! A new dimensional challenge is added to your problem solving skills when you attempt this style. Not only do you need to find the pieces that fit together but also you must build the puzzle from the base up. Julie Lewis and Ann Hambidge recently were spotted at a table beginning a new puzzle. As a soon-to-be neighbor walked by, she quickly introduced herself and became part of the group. 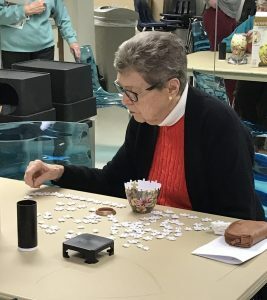 The social part of puzzle making is wonderful! Finding a new friend, finding the missing corner piece, improving your short-term memory and enhancing your muscle coordination are all part of the workout – the brain workout. Join a puzzle table today and exercise your brain!